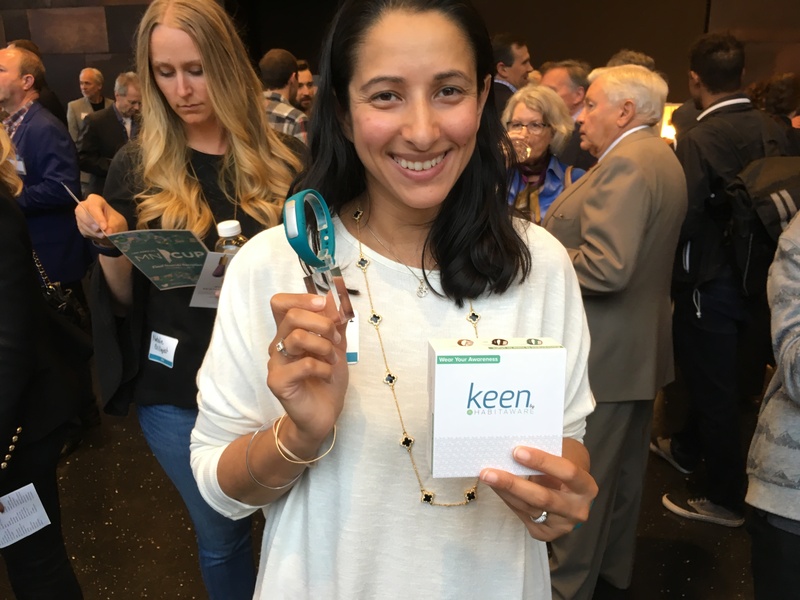 HabitAware, designer of a bracelet that helps people control compulsions such as hair-pulling and nail-biting, scored at the top of 19 contestants during the semifinal round Wednesday night of MEDA's $1 million competition for minority entrepreneurs. The firm, created by Sameer and Aneela Idnani Kumar, earlier in the week won the grand prize at the Minnesota Cup business competition. In 2014, Sameer Kumar discovered that Aneela, his wife, was hiding her stress-driven habit of picking her eyebrows. They created a bracelet to detect gestures and vibrate when it senses destructive activity. At MEDA, HabitAware received $15,000 for its top score and another $10,000 for being the top-ranked, female-owned company. The runner-up was Minneapolis-based Cytilife, developer of software that helps colleges use data to reduce dropouts. Ten finalists were chosen Wednesday night by a panel of 16 judges, following live pitches. They included: Ilerasoft of Chicago, which provides a software package that helps hospitals maximize medical equipment utilization by improving capital planning and budgeting; Mobility 4 All, a St. Paul-based "kinder, gentler'' ride-hailing service for seniors and people with disabilities; and SquarePac of Atlanta, which uses design and metal fabrication expertise to create solutions that help clients maximize space, reduce freight, save money and promote safety. The finalists proceed to a "boot camp," including investor and industry coaching, mentorship and professional connections. They will return to St. Paul in January for the finals and awards of up to $1 million dollars in financing. MEDA is the growing, north Minneapolis-based nonprofit counselor and small business minority lender. It often works in partnership with larger financial institutions that deepen relationships with borrowers as they get traction and scale. The $1 million MEDA challenge, part of Twin Cities Startup Week, is funded by the Philadelphia-based Next Fund for Innovation and corporate sponsors.